The fixture planners had given the Surrey locals a cracker to open 2015. In form S&E, on the back of an 11 match unbeaten run propelling them up the table into 3rd spot, rolled into Fowler’s Wells. Chob sitting only one place below were quietly gathering momentum and if recent matches between these two evenly matched clubs were to go by this was going to be another nail biter. The Chobham line up showed a number of very late changes with the entire selected back row of Buckland, Smith and Askew all declared unavailable due to a combination of illness, injury and work commitments respectively. In came Lewis Manning, Tom King and Tom Riley with long serving Tim Woods moving up to the bench alongside youngster Jerry Rumball making his 1st XV bow. Alex Seers also returned to the 10 shirt after an injury and university enforced absence. Manning’s call up signalled his 50th appearance and with 24 year old Harry Guy awarded Centurion status on receipt of his 100th cap today, there was certainly plenty of feel good factor in the Chobham ranks despite the late reshuffle. On the other hand the weather gods who had been kind thus far reminded us that rugby is an all seasons sport with a wet, gloomy day which certainly tested the character of the large, good humoured crowd. Referee Mr Biles got play underway and S&E opened with plenty of possession, but came up against a well marshalled home defence and Manning was strongly to the fore winning an early turnover penalty which Seers pulled wide. 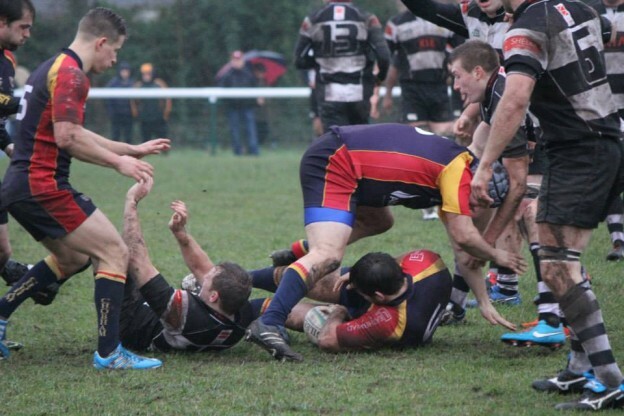 Despite the weather Chob were looking to play their lively handling game and this proved to be their undoing as on 6 minutes a misplaced pass fell straight into the hands of S&E’s right wing Kyren Ghumra and he raced in from 65 metres for the opening try. Chobham 0 Sutton & Epsom 5. 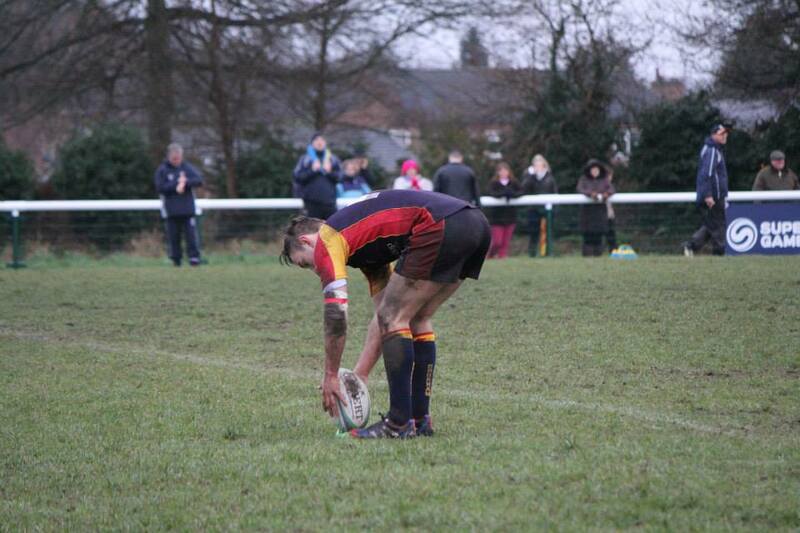 Steve Munford missed the conversion and a subsequent long range penalty attempt before S&E struck again. This time good ball retention tied in the Chob defence before the ball was moved quickly through the hands for left wing Andy Nichols to find space out wide to touch down in the corner. No conversion. Chobham 0 Sutton & Epsom 10. 15 minutes played and not quite what the Chob faithful wanted. With the usually reliable line out also creaking, it was important that the players didn’t panic and lose their shape and to their credit they retained their composure and started to squeeze the visitors both at the scrum and the breakdown gaining valuable time in the visitor’s 22. On 23 minutes, Seers found his range with a penalty to chip away at the deficit (Chobham 3 Sutton & Epsom 10) and again on 30 minutes as the S&E retreating scrum collapsed. Chobham 6 Sutton & Epsom 10. With Seers then drilling the ball deep into the red zone Chob threw the kitchen sink at the S&E try line only to be repelled by some tremendous defence with skipper Matt Whittaker and back row cohort James Caddy to the fore. The pressure yielded a further penalty for Chob which Seers knocked over before Mr Biles brought the first half to a close. Chobham 9 Sutton & Epsom 10. The coaching team of Ryan Gregory and Tony Paul would have been pleased with their group’s composure given the early 10 point deficit and with their scrum now in the ascendancy the platform was set for a positive start to the second half. The second half opened brightly for the visitors with Munford’s excellent box kicks creating plenty of opportunities for his runners although the Chobham defence expertly marshalled by Ian Barnes and Guy looked very secure under the high ball. On 47 minutes S&E increased their lead. Talisman Whittaker, a threat all afternoon, broke away from a lineout on the 22 metre line, shrugged off several tackles and crashed over under the posts. Munford added the extras. Chobham 9 Sutton & Epsom 17. Chob were back to square one, how would they respond? Well, just like the 1st half. With front rowers Kuwana, Blemings and Evans leading the way, well supported by the increasingly influential Gregory the squeeze came on S&E. As Chob camped in the red zone, S&E transgressed on several occasions and with lock Matt Harwood taking out Gregory in the air, Mr Biles lost patience and had little choice but to show yellow. 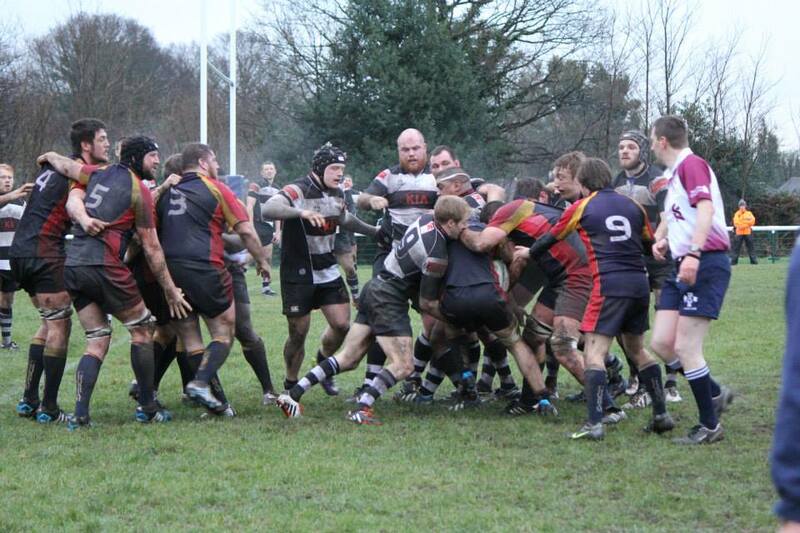 Depleted S&E were now underpowered and the hosts made the confident decision of a penalty scrum. With the engine room delivering more horsepower than a turbo charged John Deere and almost as much steam as the Flying Scotsman the Chob eight marched over and King emerged triumphant with the ball. Seers made the conversion look easy as the scoreboard changed again. 55 minutes; Chobham 16 Sutton & Epsom 17. Game on! Back came S&E but a penalty on half way which was marched forward 10 metres for some back chat gave Seers the chance to drill the ball right to the S&E try line. With the line out now fully restored an expertly taken catch and drive led to Riley burrowing over to claim the try. Again Seers converted. 65 minutes; Chobham 23 Sutton & Epsom 17. Previous watchers of encounters between these two sides know that neither lie down and back came S&E. 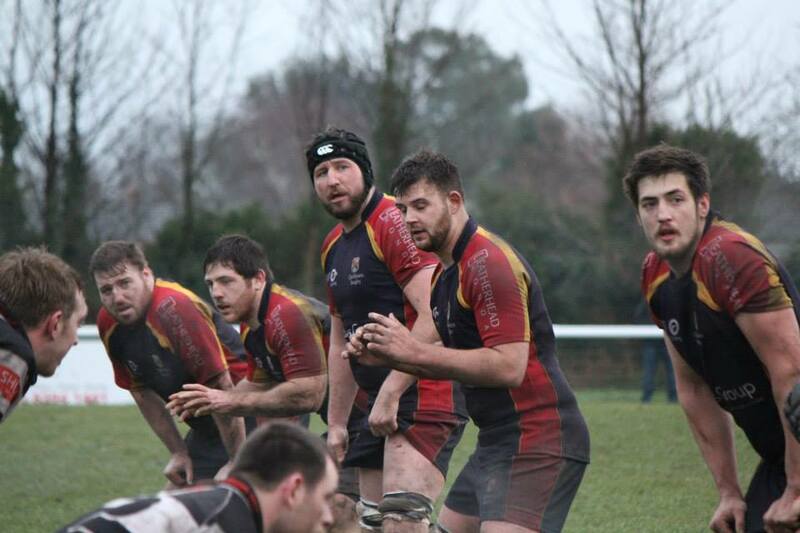 On 70 minutes, a Munford penalty reduced the deficit; Chobham 23 Sutton & Epsom 20. On 78 minutes another one. This time the lineout option was chosen by S&E and unfortunately for the visitors it went astray before Chob replacement wing Liam Monaghan deftly turned defence into attack and pinned S&E back in their own 22. With another penalty awarded to Chob, the scrum option was chosen allowing Barnes to close the game out deep in the visitor’s territory. Chobham 23 Sutton & Epsom 20. Final score. Another fantastic encounter between two fiercely competitive teams neither of whom will lie down. On a filthy afternoon the players treated the crowd to a high quality game reflecting well on both clubs and rugby in Surrey. Chob leapfrog into 3rd place but with the top two winning as expected, the promotion race remains wide open. Chob head down the M3 next Saturday to Basingstoke to take on the only side to have beaten them at home in the last year. The coaching team shouldn’t be having to look too hard for motivation during this week’s sessions.